We like to treat ourselves to a romantic steakhouse dinner from time to time. 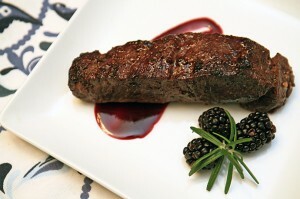 We savor the juicy flavors that come from restaurants like Ruth’s Chris, Morton’s and The Palm. Their steaks are always perfectly cooked, and so tender you could use a butter knife to cut them. So what’s the secret to those mouthwatering steaks? Butter (and a lot of it)! Also high heat – broiling the steak with temperatures reaching 500+ degrees. As much as we love dining in these high-end steakhouses, we don’t always love the price tag. So, after a lot of practice we’ve come up with this awesome Skillet Steak recipe. Got friends in town? Bring the steakhouse to your place. They will be blown away and asking for your secret to the perfect steak. Remove your steaks from the fridge about 20 minutes before you are ready to cook. Liberally season both sides with steak salt. Press the seasoning into the steak, creating a crust. Over medium high heat, place a couple of tablespoons of butter and olive oil into a skillet. Make sure you add enough to have a good 1/4 in. coating. Once the butter melts, add your steaks to the pan and allow to cook for about 4 minutes. Now tilt your pan to allow your butter to gather. Use a spoon to collect the butter and pour over top the steaks. This method is called basting and will help keep your steaks moist and tender. Do this about 10 times. Once the cooking time reaches 6 minutes, flip the steaks. Allow to cook for 1-2 minutes and repeat the basting method until the steaks reach your desired doneness. Remove from heat and allow the steaks to rest. In a small pot over medium heat add blackberries with 1 tbsp. of butter and a pinch of salt. Once the fruit starts to give off a little liquid, add in honey and vinegar. Stir every 3-4 minutes. Cook for about 10-15 minutes (halfway through the cooking process, toss in your fresh rosemary). Remove from heat and mash blackberries down with a potato masher or fork. Using a cheese cloth or fine strainer, strain blackberry sauce, use a spoon if needed to press out all of the liquid. To plate simply spread the blackberry sauce down on your plate and place the steak on top. Garnish with a rosemary and a couple of whole blackberries.